Jackie and the Buddy Bear Book! Buddy Bear Book is Finished! Here's the cover. The cut-out on the front contains a cartoon by our own Holly Hecht. There are two painted bears: the yellow one has Jackie's name written in Chinese and the blue one has the Buddy Bear theme of love, tolerance, and peace written on it. The words "United Buddy Bears" is spelled out in small heart shaped letter beads. Thank you to everyone who sent in a Buddy Bear. After much cutting, fitting, and pasting, the book is all done. There are an amazing one hundred and fifteen Buddy Bears in the book! Stamps from mail that YOU'VE sent over the last few years were used to decorate the pages. It looks really nice and Jackie's going to love it! The entire book has been photographed and can be seen by CLICKING HERE! Construction Continues on Second Edition! The Kids Corner webmaster has been hard at work cutting out Buddy Bears, pasting them in the book, and trying to keep it all in order. So far, so good. As an added feature for the Second Edition Buddy Bear Book, stamps from all over the world are being added throughout. These stamps come from mail which has been sent to the Kids Corner over the past few years. So if you've ever sent mail to the Kids Corner (or Kids Club), you may see your stamp in the book! Here are some of the pages of the new edition. You can see that the stamps are being placed on the pages with the Buddy Bears. This is the first page of the book. Stamps from all over the world have made a frame on this page. Within the frame will be a written message to Jackie. Here's a close-up of the first page frame. Do you see a stamp from your country here? Don't forget: the cut-off date for sending in your Buddy Bear for the Second Edition Buddy Bear Book is August 15th. Construction Begins on Second Edition! As you know, Jackie really enjoyed the Buddy Bear book that was sent to him in May. Therefore, a second edition is being constructed AS WE SPEAK! Check out the progress....and make sure to send in YOUR design soon. The cut-off date for sending in Buddy Bears for the Second Edition book is August 15th. That will give the webmaster time to put the book together and mail it to Jackie. Here you can see what the second edition book looks like. It's a large red scrapbook (because red is good luck in China, remember). All the bears will be cut out and pasted into the book. The name and age of the artist will be written below each bear. Here you see that some of the bears have already been cut out. Keep checking back to monitor the progress of the book. To make your own Buddy Bear Design, click here and print out the form. Electronic entries are welcome and will be displayed in the Chapter Two Buddy Bear pages but will not be included in the book unless you print out your design and mail it to the Kids Corner. Thanks for all the wonderful designs. Jackie will love them. 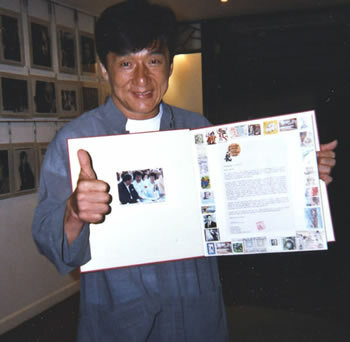 The Jackie Chan Kids Corner is part of The Official Jackie Chan Website run by the JC Group in Hong Kong.